Frugal & Fabulous: Step into Comfort - OofosThong Sandal Review & Giveaway! Step into Comfort - OofosThong Sandal Review & Giveaway! I love flip flops. I wear them all the time, even in the winter (inside of course)! So I was thrilled when my friends at Oofos offered to let me try out a pair of their super cute thong sandals! But don't get me wrong - these are not your average sandals. Not only are these shoes super lightweight -they are super comfortable! This is because they are made of an innovative, visionary material called OOfoam. They footbed of the sandal is a patented design that has unique energy absorption capabilities. They sort of look like some of those fitness sneakers where they almost look like your foot would rock forward. But these sandals are like nothing you've ever seen or worn before. these sandals are one of a kind! I received the women's original thong sandals in Fuschia (as shown above.) I wore these sandals for about 12 hours recently. I wore them while cleaning my entire house top to bottom and then while out running errands. Normally, after dashing around all day like that my feet and my legs would be killing me. But these sandals left me feeling great! Typically when I have to pick shoes for a long day of walking I'll automatically grab my sneakers - but you better believe from now on, I'll be wearing my Oofos! I can't wait to bring these with me on my next vacation. They are lightweight, durable and even machine washable! How cool is that?! Test results show OOfoam is 37% more impact absorbing than any existing EVA, the most common material found in footwear. • Delivers unparalleled cushioning to recharge & rejuvenate your feet. These sandals come in a thong style which comes in Fuschia, Tangerine, Mocha and Black or the slide style which comes in Mocha or Black. They carry women's sizes 4-11 and men's sizes 7-14. Verdict: I love these sandals and I agree with their slogan! There really is "nothing else like OOfoam on the market"! 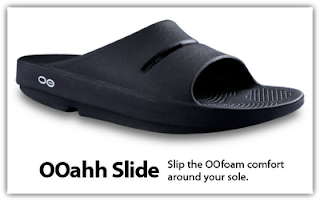 Buy it: Click here to find out where you can purchase Oofos at a store near you! I'd love to win the Ooriginal Thong women's in black! Thanks for the review! I'd like to try the Ooriginal thong in black. I would love to try the ooriginal thong style. I love flip flops! The ooriginal thong in mocha. I love the OOriginal Thong Sandal in Mocha or Black. Love to win a pair. I like the slides in mocha. I like the OOriginal Thong in Tangerine. I'd like to win the Oorignal thong in black. I'd like the ooriginal thong in black. I'm always looking for a comfortable pair of shoes. I would love the thong in black so I can wear it with EVERYTHING! I like the ooriginal thong in fushia.